President Muhammadu Buhari this afternoon observed juma'at prayer at the State House mosque. The president, alongside his aide-de-camp, chief security officer, personal physician and State Chief of Protocol, arrived the mosque at exactly 1.30pm. 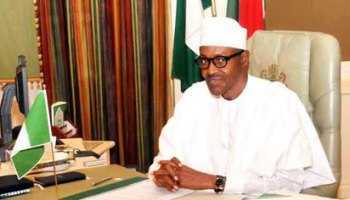 Buhari's absence at the mosque for the weekly prayer last Friday as well as his failure to attend the Federal Executive Council meetings three times had elicited speculations about his health condition. Those who joined the president for Juma'at prayer today included the Minister of FCT Muhammed Musa Bello and the Attorney-General of the Federation, Abubakar Malami. Others were National Security Adviser Babagana Monguno, the acting chairman of the EFCC Ibrahim Magu, Director-General of the Department of State Security Lawal Daura and the chairman of the National Hajj Commission of Nigeria, among others.